Scott Carson is not worried if he never plays for England again but hopes his shock move to Turkey will reignite his career. In a summer dominated by Cesc Fabregas's £30m move to Barcelona and Manchester City's signing of Sergio Aguero for almost £40m, who even noticed the England goalkeeper joining Bursaspor for £2m? Out of favour with both West Bromwich Albion and England, the 26-year-old opted for a complete change, and one he hopes can win him back both his reputation and international place. "I have three England caps," he told BBC Radio 5 live Breakfast. "That is three more than I thought I'd ever get so if I never got another cap I'd be more than happy. I hope it is not finished and I hope I can still play at that level." Carson was speaking from his new family home in the Turkish city of Bursa, having moved after receiving a surprise approach before the end of last season. "Going abroad never crossed my mind," he says. "West Brom didn't put a new contract on the table and I didn't know what Roy Hodgson was thinking as I never really spoke to him. "Once Bursaspor made contact and West Brom were willing to speak to them I thought that was the writing on the wall." 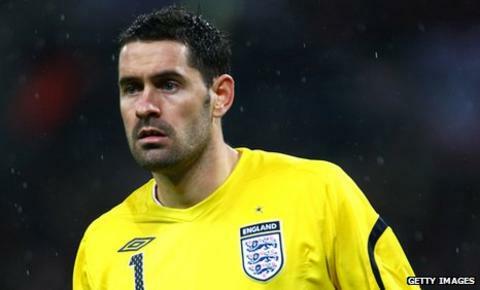 The former Liverpool goalkeeper says he did not give much thought to his international career in taking the plunge. His three caps included a horrible error in England's ill-fated Euro 2008 qualifier against Croatia, which brought the end for coach Steve McClaren. Having fallen down the pecking order under his replacement Fabio Capello, Carson felt he had nothing to lose. "I never spoke to Fabio about this, I never spoke to anyone," he says. "Even when I was at West Brom I wasn't an England regular. Maybe if I was a solid number two or fighting for the number one jersey then it might have been a different call." As it happens, Carson's new career in Turkey helped him return to the England squad for the recent game in Montenegro. "Fabio spoke to me briefly at the Montenegro game and asked me how things were going. He said he thought it was a good move for me and it was nice of him to ask," said the former Liverpool man. Bursaspor lie in mid-table after nine games, Carson keeping three clean sheets and impressing his new employers with a mature attitude. "I'm not speaking fluent Turkish yet but I'm trying to speak the words I need in games," he added. "The two centre-halves in front of me don't speak English and I don't speak Turkish but we're starting to get there. I know 'offside' and 'man-on' but it's not the easiest thing to shout when you are used to the English one-word phrases." In settling in Turkey, Carson appears to be succeeding where Scotland striker Kenny Miller failed. Miller left only 15 games into his two-and-a-half year contract with Bursaspor, but Carson has got the taste for it. "The football is great and the atmospheres are unbelievable so I'd recommend it to other English players," he said. "One day I hope to come back to the Premier League. Then again, if I play well in Turkey you don't know which other leagues may be watching you. A lot of players from here go to Spain or Germany so if I keep doing well it could broaden my profile even further."